This shrimp salad with home-made avocado dressing has to be one of my all-time favorites! There’s something so special and incredibly delicious about the flavor combination of this super easy salad! It’s refreshing and crunchy and sweet and creamy all at the same time. If you love shrimp and seafood salads, this recipe is a must try! I start by making my own, home-made creamy avocado dressing. I love this dressing as a dipping sauce, too! It’s made with loads of avocado, of course; cilantro, lime juice, olive oil and bit of garlic to add a zesty kick. Bottle up any remaining dressing and keep it in the fridge for up to a week. The shrimp is tossed with more garlic and a bit of smoked paprika for a light hint of smokiness in the dish. They’re then seared in olive oil and seasoned with a bit of cilantro for a fresh flavor twist. And then onto the salad part, this is so exciting! 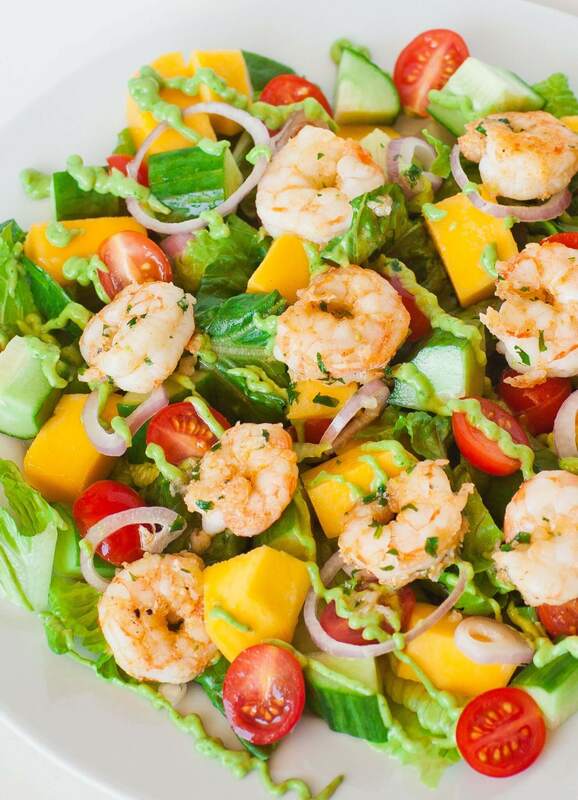 The shrimp is served over of crunchy romaine lettuce, crunchy cucumbers, sweet tomatoes, shallots and MANGO! My favorite addition to this shrimp salad. I love the sweet mango combined with the creamy avocado and juicy shrimp. The flavors remind of the tropics! If you’re looking for a new and not-so-boring salad recipe, this one is for you! Prepare the salad dressing: place avocado, garlic, cilantro, olive oil, lime juice and salt into food processor/blender and puree into a thick paste. If salad dressing is too thick for your liking, thin out with more lime juice or more olive oil. Place into a bowl or dispenser bottle and set aside. Prepare all the salad toppings and keep refrigerated until ready to assemble salad. For the shrimp: toss shrimp together with olive oil and season with black pepper, smoked paprika and a few pinches of salt. Preheat a frying pan over medium heat and add the shrimp. Cook for a few minutes, then add the garlic and chopped cilantro. Toss together and cook for a few more minutes until shrimp are done; do not overcook shrimp! To assemble salad: spread Romaine lettuce onto plate, followed by chopped mango, tomatoes, cucumber and shallot rings. Add garlic shrimp and top with salad dressing. Serve immediately or keep all ingredients refrigerated until ready to serve. Your recipe videos are wonderful.. they are very well put together. Most importantly you are quiet, and have the perfect decorum. Other cooking videos are so distracting with loud voices and so much personal banter. Yours are professional and give the watcher exactly what we are looking for: clear undistracted direction. The instructions are organized, well presented, and easy to follow. The recipes are wonderful. Thank you Tatyana.